Winters' Day In: 2:45 a.m. I don't know why there were little white lines on the clouds--although I know that the clouds were way too low for this, it made me smile to think that the sun was reflecting off the polar icecap from the other side of the globe and bouncing up into my sky. I lightened it up a little in this next photo. It looks a little like water, doesn't it? Or maybe that was just my imagination playing tricks on me... even though you wouldn't know by the sky, it was really quite late! The hazy glow had already started to work its way eastward, so it could burst forth in full daylight only a few hours later. 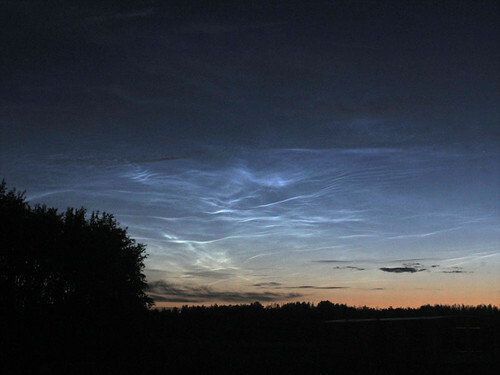 Edit, June 15: My dad just "illuminated" me on the mystery of these clouds. They are called "noctilucent clouds", and really are quite high and at the edge of a larger polar cloud formation. You can read the Wikipedia article here. Those are BEAUTIFUL pictures!! Would make a great wall picture!